If asked which of the signs are most accident prone, most people would suggest Aries. The sign is known for quick reactions, acting first and thinking about it later. Common sense might suggest that they would be more inclined to bump into things than slower signs like Capricorn or Taurus. Is there any truth in it, however ? Capricorn Research has a collection of 321 birth charts of accident victims and has decided to find out. Well the answer is no. In the sample 26 had the Sun in Aries with the expected average being 26.75. In fact the most common sun sign in the sample is Cancer with 32. Perhaps Cancerians are such stay at home types that they get nervous on their travels and are more likely to have accidents. Don’t worry Cancer, this figure is not statistically significant. In fact if you are sitting next to an Aries on a plane you can breathe a sigh of relief. In the collection, 91 of these are Air crashes and out of this figure only 5 has the Sun in Aries. The average is 7.5. If your neighbour is a careful and steady Taurean with a score of 13, the sample shows they are nearly 3 times more likely to be involved in an air crash than an Aries. This is mildly interesting but not something to worry about as the sample is far too small to concern the statisticians. Is that it then ? Well no, obviously or Capricorn Research wouldn’t be doing an article on it. Any astrologer worth their salt would say that its not about Sun signs. Mars is the planet or drive, assertiveness and physical expression through movement so we should really look at that. This is the distribution. Amazingly given the common assumptions, Mars in Aries ( the first sign on the graph ) scores by far the lowest at 12 out of 321, the next lowest score is Sagittarius ( 9th ) with 21. The highest is Mars in Libra ( 7th ) with 39. 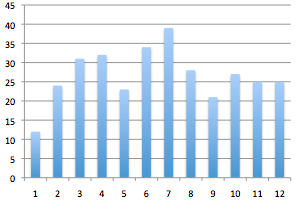 This distribution has a Chi Square figure of 0.049, just at the point where statisticians start to take it seriously. The smaller Air Crash sample is even more interesting. Only 1 has Mars in Aries while Mars in Virgo has 16. The sample is small and if this was replicated on a large scale, people would have to take their charts with them to airports. It is statistically significant however with a Chi Square score of 0.0058. Whilst being significant it doesn’t seem to follow standard astrological advice. Its a fair bet that any computerised astrology chart for Mars in Aries would contain the advice to be careful whilst travelling whereas Mars in Virgo or Libra would have no such concerns. Have astrologers got it wrong then ? Well stunning as the Mars distribution is, positions of planets by sign do not tell the whole story. For more information we need to look at Mars’ house placings. In an extraordinary mirror image distribution, Mars in the 1st house comes easily top with 38 whereas in the 1st sign ( Aries ) it came last by far. 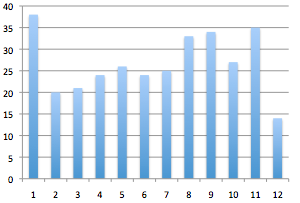 This distribution has a Chi Square of 0.04, again enough for statisticians to have a look. Mars in the 1st scores three times as high as Mars in the 12th. From a classic astrological perspective this is very interesting. 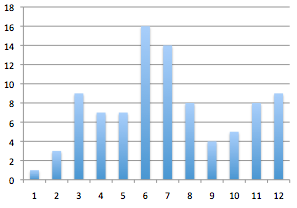 This distribution has a Chi Square of 0.0036 which is again statistically significant. The first house rules those things that we feel compelled to express in our lives and Mars here indicates a powerful drive to assert oneself almost regardless of the sign its in. With Mars rising we would expect more accidents. Its also interesting that the 9th and 8th houses score highly. The 9th house rules long journeys so that could be a factor. The 8th house traditionally rules death and many members of the sample would have died in accidents. A similar finding to this can be found by looking at rising signs. Out of 321 Accident Victims, Aries is rising 23 times. That doesn’t sound much but all rising signs do not occur with the same frequency. For northern latitudes where most of these charts come from, the expected number for Aries rising would be 15 out of 321, so the total is more than 150% of the expected figure. 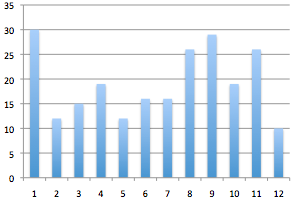 Aries rising score is the highest of all rising signs given their expected frequency. Another interesting parallel to the Mars house positions is that Aries rising in the charts of the 91 Air Crash Victims comes very close to the expected figure. So for the 230 Accident Victims not including the Air Crashes, Aries is rising 18 times against an expected number of 11, so scoring 165% of the expected figure, again the highest score given expected frequency. So there seems to be a tendency for people with Mars or Aries ( Mars’ sign ) rising to be more accident prone than any other group. There also seems to be a difference between accidents in general and air crashes in particular. This is not surprising given the relative chances of survival. But also air crashes are not generally related to the make up of the individual in the same way that car crashes may be. There are also certain aspects between planets that occur significantly more frequently than others. Most of these aspects fit well with astrological thinking. In the 230 Accident Victims not including air crashes, the Sun is conjunct Saturn 23 times, 80% above the expected figure. Mars is also conjunct Saturn 17 times which is 66% above average. These two findings are not surprising as Saturn rules obstacles and restrictions and to crash into something is a fairly clear Saturnine experience. Mars is conjunct Jupiter 18 times which is 76% above expected and the opposition between these two planets 17 times, 57% above average. On the face of it this might seem strange as Jupiter is the principle of expansion and the polar opposite to Saturn. Jupiter with Mars, however can lead to extravagance and indulgent behaviour ( particularly in the case of the opposition ) and people with this placing are perhaps more inclined to have a strong sense of adventure. They would probably travel more than most but are often less careful and may be more inclined too move too fast and take risks. Mars is conjunct Pluto 18 times, again 76% above average. The Moon opposition Pluto occurs 64% above average and the conjunction of these two 40% more often than expected as well. Given Pluto’s connection with drastic and sudden events, these findings would go along with astrological thinking. The oppositions between Venus and both Saturn and Neptune occur 86% above average. For 91 Air crash Victims, Mars aspects score very low, mostly well below the expected level, the only exception being the classically accident prone Mars square Uranus at 48% above. Oddly Venus is conjunct Jupiter 73% above expected but the one to look out for is the Venus / Pluto conjunction with 123% above average. Mercury square Pluto is another tricky one with 114% above expected. To answer the original question the Sun or Mars in Aries is clearly not accident prone. In fact Aries seems to be the safest position for Mars. Aries rising or Mars in the first house however, tells the opposite story. By the way if you are concerned about your neighbour on an plane, don’t ask for their Sun sign. If you’re worried get their whole chart details and if they’ve got Mars in Virgo in the 5th house square Uranus in the 8th, along with a Venus / Pluto conjunction you still probably shouldn’t run screaming from the plane unless its a particularly small plane and you’re sitting next to the pilot. It is only a small sample of 91 victims that we’re working with, but maybe pay a little more attention to the flight attendant as they go through the safety ritual.